am a domestic abuse survivor and I support myself and my son through sales of my Art work. I have kept the fact I experienced domestic abuse very private until now. I always knew that I would share my story. I thought it would be after I re-conquered the world and I was back on top of my game, but something happened last week that changed my mind. Last September I moved 1500 miles, with my eight year old son, to start a new life with a man I had known for 7 years. I had dated on and off for that time. The off time was mainly due to the fact he had moved to upstate New York. I lived in Florida. I didn’t want to move and I was busy tending my career selling luxury watches. But then I quit my job to focus on my Art career. He asked me to move, he said it would be the perfect opportunity to grown my Art business. It sounded good to me, after all I though I knew him. Once I got up there things took a turn I could never have imagined. He was controlling, jealous relationship with my son. Things went from bad to worse until it was an abusive situation. My mother didn’t bring me up like that so I fled. I left with my car full of my belonging, my dog and my son and barely any money in my pocket. Someone how I made it all the way back down to Florida. 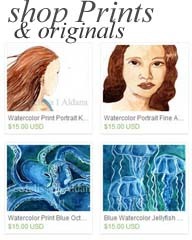 I immediately started looking for a regular job but I am an Artist and I kept my son and myself afloat with sales from my two online shops, Aldana Paintings for my paintings and prints and Aldana Decorative Art for my mason jar goodies and vases. 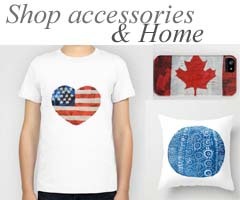 I spend a few hours a day filling out job applications and 4-6 hours a day promoting my shop. With my sales I was able to cover my car payment, insurance and my cell phone. I was lucky to be staying with an friend who understood I wanted to contribute the household but couldn’t. Then the sales stopped. I kept waiting and waiting for a sale any sale, usually I sold something every day. No sale came. I waited until there was almost no food in the fridge and no gas in my car for the sale I was sure was coming. organization in my area, there was only one listed. They reminded me of the credit card company when you call. They transferred me around and once the found out I had a safe place to stay seemed to have little interest in helping. They did give me two numbers for food pantries, one turned out to be another organization called No More Tears and God bless the founder Somy, the number they gave me was her cell phone. She was on vacation and took the time to make some calls and organized a $50 gift card from the supermarket for me. It came from an origination I had seen on TV Neighbors for Neighbors. She also gave me number of a local food bank. I now that the number to two food banks I called both, one didn’t return my call the other said they were open Saturday in the morning. I wouldn’t get the gift card until Saturday afternoon two days away but I made it work. With my car fuel gauge on “E” I drove out to the food bank with my fingers crossed I wouldn’t run out of gas, it was 8 miles round trip. It was at a church, when I got there they casually told me there was no food bank, I had gotten the wrong information on the phone and the food bank would be open the first Saturday in March, 3 weeks away. I was furious, not at them they didn’t owe me anything, but at myself for getting into this position. I would have to take control and made a way for myself. When I got that supermarket gift card I was so grateful. 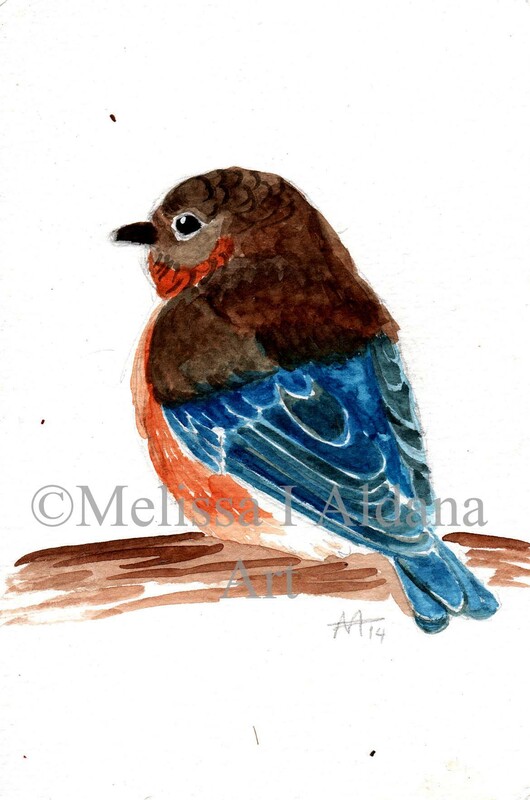 I painted a sweet little blue bird for the person who sent to me as thanks and popped it in the mail. I had kept the fact that I was a domestic abuse survivor to myself. I guess I was embarrassed. I was afraid of looking like a fool. I have talent as an Artist, I decided I was doing to knock on every door send a message to everyone and knew and let them know I am an Artist, a Domestic Abuse survivor and I support myself and my son through my Art. my work can buy it. That is all I am asking for people share my story and in turn my Art. Share this page on Facebook, twitter the usual places and unusual places. I want to make my way with the sweat of my brow not by someone giving me something because they feel sorry for me. I was raised to work for what you want. 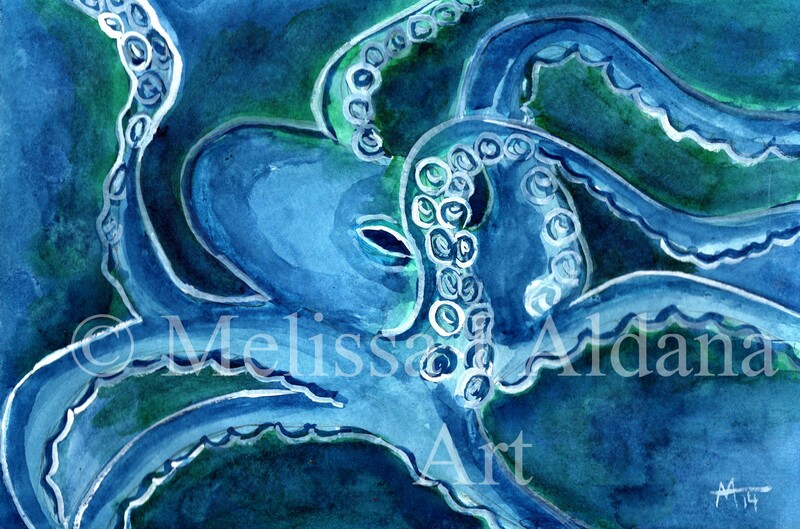 Please contact me at Melissa@AldanaArt.com if you have any questions or want me to make a piece of Art for you. The real deal of my life.